More About Kalmia latifolia "Forever Red"
Forever Red, also called mountain laurel, is a robust, dense, and symmetrical in youth stages. 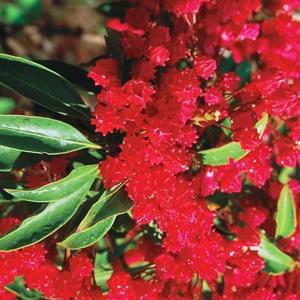 As plant gets older it becomes more loose, open, and sensational with colorful terminal clusters. It takes a little more effort to grow the Kalmia but the rewards are well worth it. If not using in a naturalized area the Kalmia can be pruned to retain a dense and compact form. Pruning is done soon after the flowers have faded as next seasons buds form on the new wood. Branches and bark can be used to create furniture and other artistic efforts.